Yes, it’s once again that time of year when people dress up as ghosts and goblins and famous pop culture figures from long ago all in the vain attempt to score some sweet, sweet candy … or get plastered and (hopefully) lucky at the office party. Ah yes, Halloween! One of those rare holidays where both the kids and adults suffer the next day (the kids from the inevitable sugar crash – the adults from awkward social encounters due to ill advised one night stands – and sugar crashes). But it isn’t just the “real” populace that celebrates this time of year, our good friends in the fictional four-color world we all love also like to get into the act. Heck, most of the costumes being worn out there are taken from fictional characters. Spider-Man, Superman, Iron Man, and so on – I tell you, it’s this time of year that you realize just how ridiculous these costumes from the printed page look in real life. Then there are the more interesting tropes, the times when characters decide to wear costumes that don’t even belong to them. There is something refreshing about seeing a character dress up as someone else – for instance I can recall a DC comics Elseworlds tale where a baby Kal (Superman) El landed and was found by the Wayne family and eventually it was he who dressed up as a bat to terrify Gotham’s underworld. I can’t remember much about the story, but I can still remember the costume and image of “Batman” flying over Gotham City. Noticeably absent from the cover, Aquaman and Robin. Makes you think. 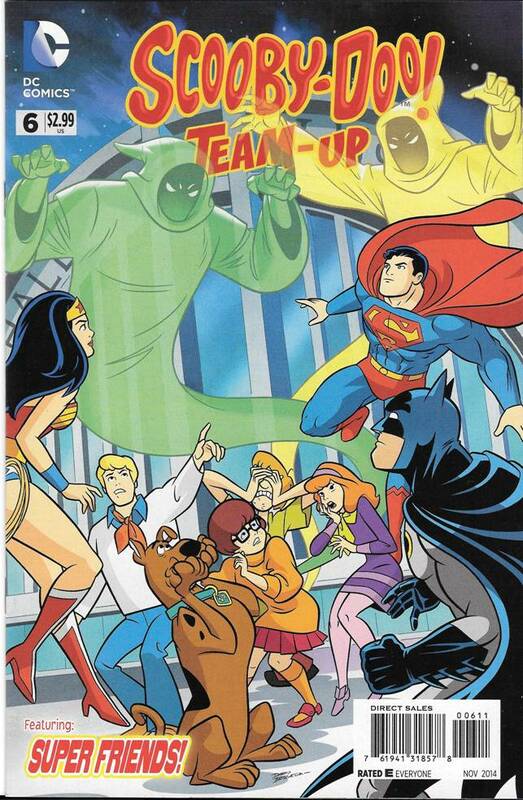 Yes, Scooby Doo Team-Up #6 featuring the Super Friends! No doubt some out there are wondering why the Justice League are being called the Super Friends in this comic book to which all I can say is search the web or ask your Grandpa. Anyway, the Hall of Justice is being haunted (shocker!) 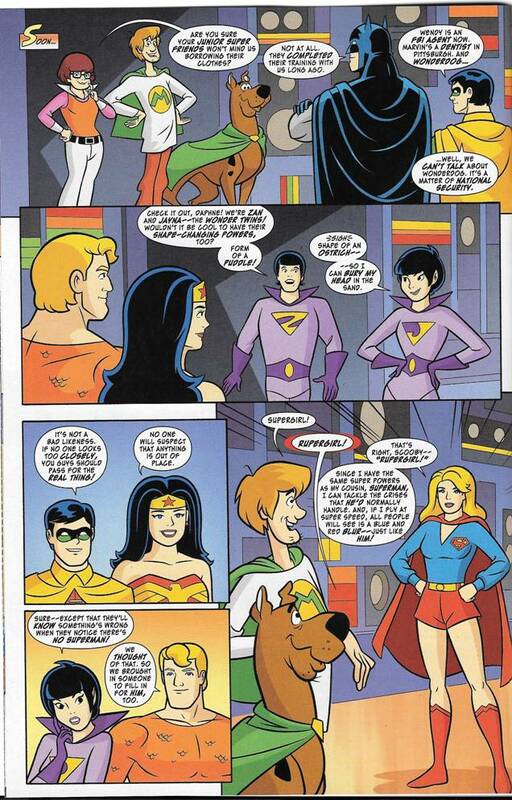 so the Super Friends call in Scooby and the gang to investigate seeing as how that’s their whole shtick. 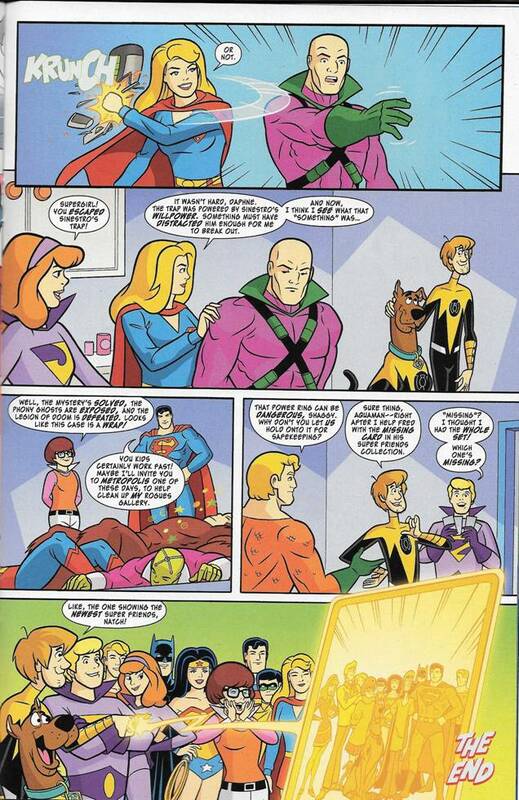 So why does the world’s most powerful group of heroes ever assembled (and Aquaman), a team that boasts not only “the world’s greatest detective”, but also a man with x-ray vision and super senses, need a bunch of teenagers and their talking dog to solve the mystery of the haunted clubhouse? 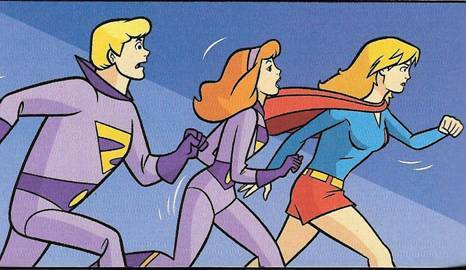 Apparently the Super Friends don’t want to panic the world by announcing that their house is haunted and that Superman is missing and that they’ll be taking a breather fighting crime to solve the problem, so they decided to outsource the problem while continuing their daring do! Since they’re cheap, they hire Scooby and the gang who literally work for food (Scooby Snacks to be specific). Now, to make sure no one notices and starts a world panic they insist the kids and Scooby disguise themselves while on the case, and voila! No sooner are introductions finished when the ghosts attack. And just like me Lucky Charms they’ve got all the colors of the rainbow! 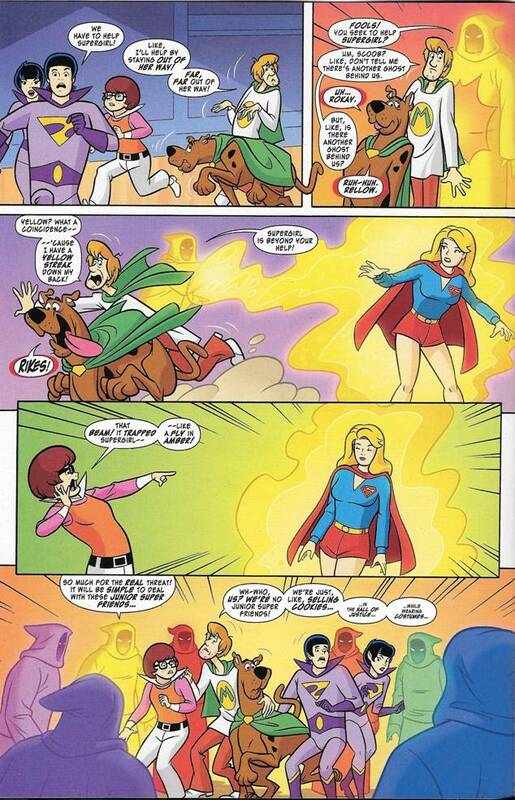 It looks pretty bad for Shaggy and friends, especially now that Supergirl is out of the way. Before they attack the hapless teens the ghosts remove their hoods and reveal that they are actually the Legion of Doom! No, not the wrestling tag team, but the Super Friend’s arch enemies, with a color coordinating each villain. For example, Sinestro, Green Lantern’s arch enemy, is the yellow ghost because his ring projects yellow energy. It looks bad for Scooby Doo and his friends but in a miraculous feat they manage to do something the world’s greatest heroes (and Aquaman) couldn’t and escape by running away! Where the hell did Supergirl come from??? She just shows up out of nowhere! Seriously, she was trapped by Sinestro, it’s a major plot point to the story, and Velma even says “You two start searching the kitchen” to Fred and Daphne and Velma’s the one who pointed out Supergirl was trapped earlier! 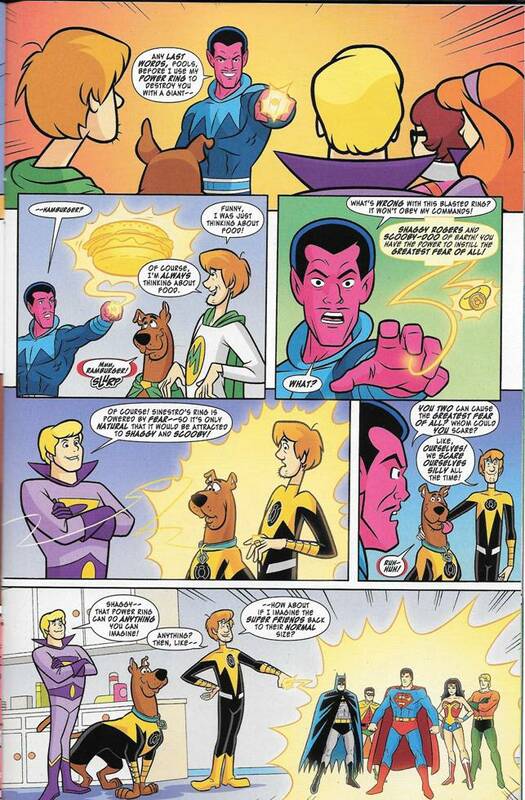 The teens find the shrunken superheroes but just then the Legion attacks – or to be more accurate, Sinestro attacks! 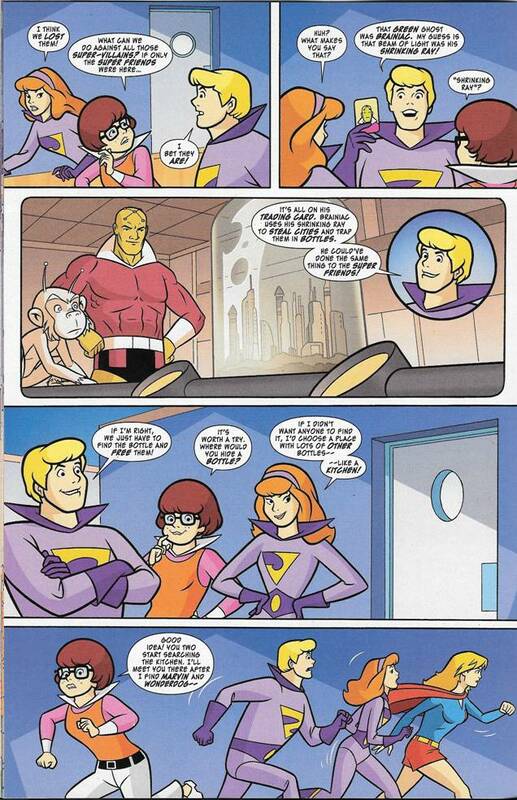 And there it is, the mega-happy ending (for Velma anyway, just look at her, she’s freaking out!). Aside from the mystery of the phantom Supergirl everything has been wrapped up nicely. Overall this was a fun read and I feel a nice segue way for the season. 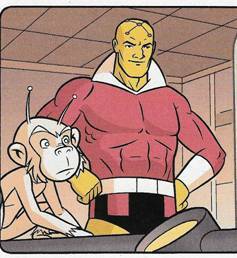 And hey, if you’re still having trouble coming up with a costume, why not skip the obvious and go as Brainiac’s up to now, never before seen, pet albino space monkey! Seriously, I … he’s an evil collector of knowledge… what’s the point of the monkey? Just, why?